Sorry that I'll only be doing the translations for these two players. Q: You succeeded in remaining in Code S. How does it feel? A: I'm feeling good. It feels like I'm back to my rightful place after getting knocked out of the Code S round of 16. As a player who has been champion, I thought I definitely should be in Code S.
Q: You got a 2:0 victory. Wasn't there any difficulty in getting this sweeping victory? A: The first game was won really comfortably. I thought I would be able to win the second game easily because I had a good win record with that in practice, but the banshees made the situation really bad and there was a crisis. However, I concentrated on producing an army, and with good control, I manage to make a comeback. Q: Your fast raven in game 2 was very effective. A: I should have been at an advantage after the opening, but because I didn't scan my opponent, I didn't know my opponent was producing banshees. I was placed in a crisis situation at a time when I didn't expect it. Q: Unfortunately, you were eliminated in Code S round of 16. A: I did not prepare well for the round of 16. I didn't study my opponent's style well enough, and he even deviated from his original style of play. He played really well. When we got back to the hostel, my team mates were telling me that the games I played were less than even half of my usual standard. Q: Are you really prepared and looking forward for the next season to arrive? A: Even though I was eliminated this season, this elimination gave me the opportunity to have a rest time with my team mates. We went skiing together, and I also adjusted my own mentality. Hopefully I'll be able to at least make the round of 4 next season. Q: The GSTL finals will be held in Las Vegas, but your team is still in the round of 8 loser's group. A: Before, I only heard rumours about it, so I didn't really dare to believe it. When I woke up this morning, I realised that it was real. So my team and I agreed that we had to make it to Las Vegas. We are facing IM next. As long as we can prevent their players from going rampant, we should be able to win. I've never been to any international tournaments, and so I really wish to play in the United States. Q: Any last things to add? A: I want to thank the players who practised with me, NSH_Hoon, NSH_Shuttle, MVP_Noblesse. There'll be the Code A Preliminaries next week, and there are many players from our team taking part in it. I hope they'll get good results. I also hope we will beat IM in GSTL. A: I'm so happy I can't stop smiling. I can't believe it. This really feels like a dream. During practice, I even prepared for the late late game, but the games ended so fast. It was really strange. Q: In the first games, the 3 stalkers really accomplished a lot. A: Such a situation is usually really rare, but because my opponent was playing too greedy economically, it worked out that way. I just wanted to apply a wave of pressure, but the game just ended like that. Q: You used a 4-gate in the second game, whereas your opponent opened with a double expand. A: It was a strategy that I didn't use even once during practice, but Inca recommended that I use it in the second game if I won the first game. When I didn't see the scout from my opponent, I decided to use the strategy. At that time, I didn't know my opponent opened with a double expand. Q: You were eliminated 3 times, and finally at the fourth try, you manage to get promoted into Code S. Your performance in foreign tournaments is very good though. 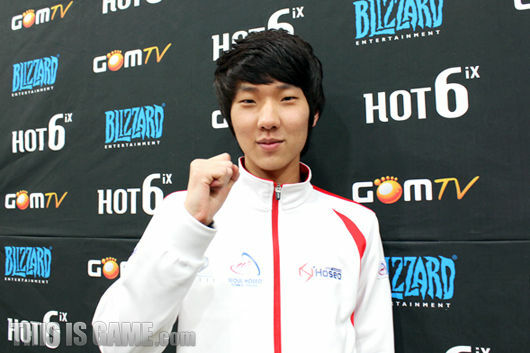 A: When I play in the GSL, I tend to have difficulties breathing and be more nervous than usual. The pressure is also tremendous. When I'm abroad, no matter how strong my opponents are, I don't get nervous. But when I'm here, I just get really nervous. I don't know why either. Q: Actually, Code S and Code A are pretty much just separated by a really thin line. Are you filled with expectation with your first time being in Code S? A: Because it's my first time playing in the tournament, it should be quite fun and interesting whether I win or lose. I've been hoping to playing in Code S ever since Starcraft 2 came out, so I really want to win now. Q: What type of results will you be satisfied by? A: If I can win the whole tournament straight away, that would of course be the best. But that's kind of difficult to do. I hope to be able to make it at least to the round of 8. I never want to have to fight for a spot in Code S again (laughs). I want to make the most of the opportunity I have now. 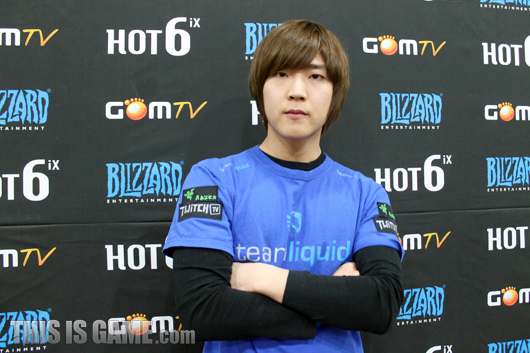 Q: This is a strong time for Protoss. Is that good news for you? A: I don't really have any thoughts towards the balance of the races. I feel that whoever plays well wins. Even if there was some difference between the balance of the races, shouldn't the player still be able to win if he plays well? I will play as I always have, except that since I am in Code S now. I think the future looks qutie promising. Q: Are there any opponents that you wish to avoid in Code S? Q: Any last things you wish to say? A: I want to thank our sponsors, The Little App Factory, Twitch TV, Razer. Top didn't sleep until 6am in the morning just to help me practise. I tend to practise through the night before tournaments, but it's very hard to find players who will practise with me at the late hours of the night. Thanks to him, I was able to practise properly. I also want to thank the players who practised with me, ForGG hyung, TheWind hyung. I want to thank my oGs team mates, and all the people at Team Liquid. The manager Robin has taken very good care of me. I hope they can be proud of this. Finally, I want to thank my parents. For the Interviews with SlayerS_Taeja and SlayerS_Ryung, please go to the following link. Modest HerO saying that he won with rushes when he was planning to do macro anyways, GL in code S! In the second last question, Hero says that he wishes to see Jinro and Hayder make it through the qualifiers. He says Hayder will probably reject a seed to prove himself and the same of course for Jinro. I swear Jjakji's nose is cuter than the fairies' in Disney movies who twitch their noses and do magic. I love how all these teams wanna get to Vegas. Tougher competition is good. Are you doing the Taeja and Ryung one too? Thanks for translating. Really happy for Hero, he deserves his spot in Code S.